The endangered plant na'ena'e (Dubautia waialeale), shown in the foreground, thrives in the rainy habitat of Mount Waialeale. There's a place in India that may average a few more inches of rain per year than Kauai's Mount Waialeale. But after the first 38 feet, who's counting? And there may be places that get more rain per day in monsoon season but then dry out the rest of the year. Cloud for cloud, day after day, Mount Waialeale, elevation 5,208 feet above sea level, is one of the wettest spots on Earth. 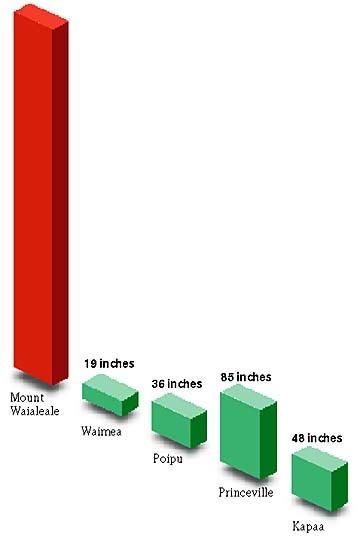 Mount Waialeale's most recent 32-year average was 460 inches a year. Its driest years on record were 218 inches in 1926 and 244 inches in 1993. 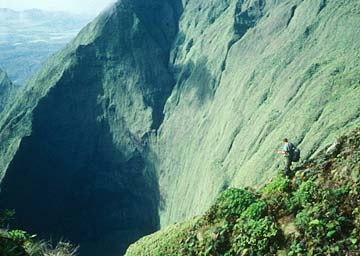 In 2001, considered a dry year for the state as a whole, Mount Waialeale reaped "just" 396 inches. 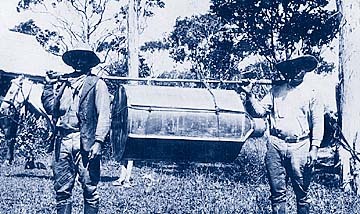 On July 12, 1928, Holo and Puaokina packed a 900-inch rain gauge to Waialeale, Kauai. Nori Kojiri knows the wetness of the mountain firsthand. The retired U.S. Geological Survey worker on Kauai used to ride a mule once a year to measure how much water had collected in the 900-inch- capacity rain gauge. The survey has been collecting rainfall measurements there, in cooperation with the National Weather Service, since 1911. The information is used to help estimate ground-water resources and predict flood conditions. "We'd usually go in June," Kojiri said -- two survey employees and a mule handler, starting in Waimea Canyon and riding up through the Alakai Swamp to a cabin where they spent the night. The next day, the geological survey employees would ride mules until it was too soggy for the animals to go on. Then they would tie them and continue another 2 1/2 to three hours through bog that often was knee deep, and sometimes waist deep. 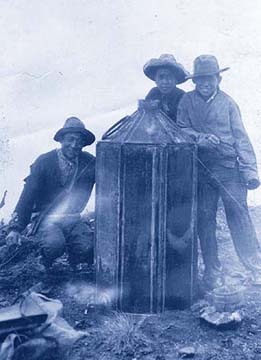 Three men posed on Mount Waialeale with a rain gauge on July 18, 1933. The men are reported to be a Mr. Shimiguchi, his nephew Joseph and his son Eddie. "Usually when we used to go up by foot, it was foggy, and you couldn't see 10 feet or 15 feet ahead of you," Kojiri recalled. His summation of the journey he made nine or 10 times: "Rough trip." Up there, "it was usually blowing and kind of windy," Kojiri said, so after the descent by mule to the cabin, usually soaking wet, the men were happy to dry out by the wood stove. It wasn't until the geological service started using helicopters in the early 1960s to access the rain gauges that Kojiri actually saw the view from the mountaintop. For safety reasons, the helicopters can only make the trip when skies are clear. Since switching to helicopter access, the timing is a little different. Roy Taogoshi, current geological service Kauai field office chief, said he has an agreement with a helicopter company that if there's a clear day anytime near three months from the last reading, they go. There are rarely more than 50 clear days a year, and those need to synchronize with helicopter availability and wind conditions. "The wind is the biggest factor" when flying in by helicopter, said Clayton Yoshida, a geological services hydrologic technician. "The wind has to be low, usually a period of Kona winds. Summer might be the hardest because of the tradewinds. Pilots are kind of reluctant to fly into that cloud cover, and the winds can be pretty tricky." Plans are in the works to add a remote sensor to the rain gauge, which will allow rainfall data to be available "almost in real time," Taogoshi said. But crews still will have to make periodic trips to maintain equipment. Kauai is the wettest of the Hawaiian islands, with an average of 100 inches of rainfall a year, compared with Oahu's 75 inches and the Big Island's 58, said Thomas Schroeder, chairman of the University of Hawaii Meteorology Department. "I think weather and climate in Hawaii is the most fascinating in the world," Schroeder said. "The gradients of weather we have in the state are remarkable." One of the most remarkable is on top of Kauai. There, he said, "you get rainfall variation within a hundred yards that is greater than anywhere in the world. "From one end zone to the other end zone in Aloha Stadium, the difference in annual rainfall would be 7 inches --that's greater than the difference between Chicago and Louisville. That's a world record." Although Kauai gets far more rainfall than the other Hawaiian islands, it has a lot of surface runoff of water into the ocean, and its underground aquifers don't yield as much available water as Oahu, Schroeder said. 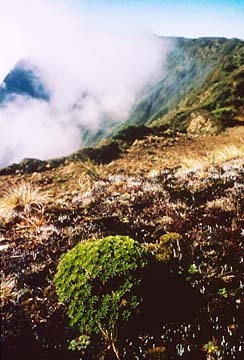 Only particularly adapted plants thrive in the combination of water, wind, altitude and scarce sunlight that Mount Waialeale and its sister peak, Mount Kawaikini, elevation 5,243 feet, provide. "It's sort of barren land up there," Taogoshi said of the landscape on Mount Waialeale. "If anything grows, it's close to the ground." Former U.S. Fish and Wildlife employee Loyal Mehrhoff recently approached rain gauges atop Mount Waialeale. The mountain receives an average of 460 inches of rain a year. The top of the mountain is relatively flat and open, with low, rolling hills that end in precipitous cliffs in the east. Its heavy, boggy soil supports a variety of mosses, sedges and grasses and a few low shrubs but no trees. Kauai botanist Steve Perlman has hiked to Waialeale three times (taking two days up and two days down) and has been there many more times via helicopter to survey native plants. For him, the mountain is a last stand of several endangered plants, some of which are found nowhere else. His reports on the plants there resulted in the U.S. Forest Service fencing off some areas to keep out the shaggy feral pigs and goats that roam there. Hiking and camping in the area, other than for research purposes, is not allowed because of its hazardous conditions. Perlman said there are a few landmarks on the mountain. One of them is the remains of Hawaiian heiau. The other is a pool of water that appears to have been altered by Hawaiians so that it drains both to the east and west instead of just the west, its natural drainage direction. Today, Perlman wonders why the ancient Hawaiians made that alteration. Fifty years ago, Kojiri wondered the same thing. But like a lot of things about the mountain, it remains a mystery. At the summit of Mount Waialeale is a small lake but no trees. Twenty years ago, a record 683 inches of rain fell over a 12-month period on Mount Waialeale. It is arguably the wettest place on Earth, with an average annual rainfall of 460 inches. Here's why raindrops keep falling on this 5,208-foot peak. When warm air reaches a mountain range, it is lifted up the mountain slope, cooling as it rises. This process is known as orographic lifting, a process common to all mountain ranges. 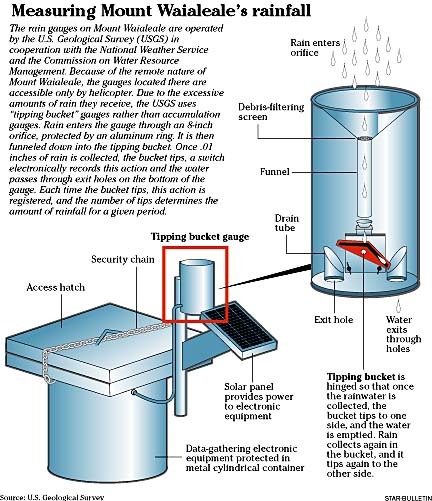 It is the main rainfall-producing mechanism in Hawaii. 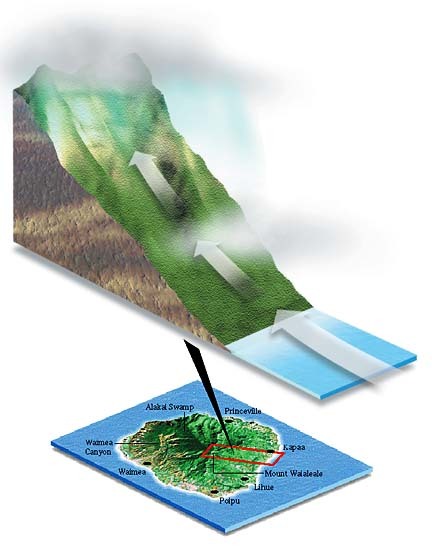 Here, orographic lifting of moisture-laden northeast tradewinds over the windward slopes of each island creates wet windward weather and dry leeward weather. Just 15 miles west of Mount Waialeale, the Kekaha coastal region receives less than 20 inches of rain a year. This condition is called a "rainshadow." At the famous "Blue Hole," Mount Waialeale drops off precipitously. 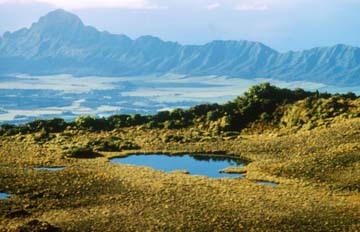 Mount Waialeale received an average annual rainfall of 460 inches over a 32-year period. However, measurements over 38 years at Mawsynram, India, give it an edge of 7.4 inches per year; in 1860, nearby Cherrapunji recorded an unofficial 1,000 inches. Tradewinds arrive from the northeast. When the air rises, it expands in the higher levels of the atmosphere, which causes it to cool. This is called adiabatic cooling. When the air cools and reaches its dew point, water vapor condenses to form clouds. As the clouds rise, they become more and more saturated with moisture. When clouds reach their saturation point, rain begins to fall. Unlike mountains on other islands, Mount Waialeale is subjected to this sequence almost continuously due to three factors: its shape, location and height (details below). The tradewind inversion layer exists during most of the year throughout the Hawaiian Islands. It is a cap that prevents the cooler air below from rising above 6,000 feet. The tradewind inversion layer also restricts vertical development of towering cumulus clouds needed to form thunderstorms -- less than 10 a year are average for Hawaii. Kauai is the wettest island in the Hawaiian chain, with an average of 100 inches of rain per year, and Mount Waialeale is by far the wettest spot on the Garden Island. The peak gets more than five times as much as its nearest measured rival on Kauai with an average annual rainfall of 460 inches (more than 38 feet) per year over a 32-year span. Kauai's location as the most northward of the main Hawaiian islands makes it more prone to midlatitude frontal systems that bring rainfall during winter. In contrast, the Big Island, the southernmost island, experiences less rainfall caused by frontal systems. Kauai's shape is relatively round, with no irregular mountain formations to funnel or block weather systems away from its peak. This subjects Mount Waialeale to different weather patterns such as frontal rain bands or Kona lows from almost every direction during all seasons. Mount Waialeale's 5,208-foot peak is just below the tradewind inversion layer at 6,000 feet in altitude. Clouds cannot rise above this layer, and with the continuous rising of these clouds upward, rain falls at or near its top. This contrasts with Mauna Loa on the Big Island, which is much higher (13,680 feet) than the inversion layer, and thus its peak remains dry and arid.